Democrats gained 30 seats and seized control of the House of Representatives, flipping 36 districts that Republicans won in 2016. These gains were driven by a mix of successful female candidates, exceptional voter turnout and support from wealthy, suburban voters. 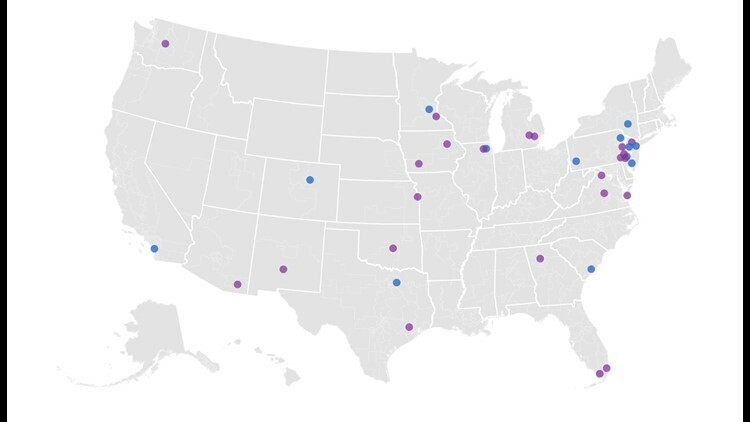 Female candidates won in 23 of the 36 districts that Democrats took on Tuesday. This surge in wins by women – which has roots in resistance to the Trump presidency – resulted in gains for Democrats during this election cycle. Twenty-one of the districts that changed hands saw more votes for the Democrat than in 2016, excluding Pennsylvania districts, which are not comparable to the last election. Minnesota's 3rd District was emblematic of the increase in Democratic turnout. In 2016, the Democratic candidate got 169,000 votes, losing to Republican Eric Paulsen by 13 points. Tuesday, more than 202,000 cast their votes for Dean Phillips, who beat Paulsen by nearly the same margin. Democrats did well in districts populated with wealthy voters and those who benefited from low unemployment and a strong economy. Twenty-seven of the 36 flipped districts had above average median household income and 30 of 36 had lower than average unemployment. Despite losing in most rural districts, Democrats made significant inroads with suburban voters. Twenty-six of the flipped districts had an above-average percentage of the population living in urban areas. Twenty-seven of the districts had a greater percentage of college-educated voters than the national average. Redistricting contributed to these wins, especially in Pennsylvania, where a state court redrew congressional districts to curb a GOP advantage gained through gerrymandering. Democrats increased their share of the vote by an average of 9 percentage points in the districts they took. The biggest change came in California’s 49th District, where the share of Democratic votes jumped from 30 percent in 2016 to 54 percent this year. This trend holds across the most of the country – even in the places they lost, Democrats gained a greater share of the vote than they did in 2016. Contributing: Matt Wynn, John Fritze, Brad Heath, Mark Nichols and Jim Sergent. Sources: USA TODAY analysis, The Associated Press, U.S. Census Bureau. Photo: Democrat Madeleine Dean celebrates Tuesday after winning Pennsylvania's 4th Congressional District race. Charles Fox/AP.